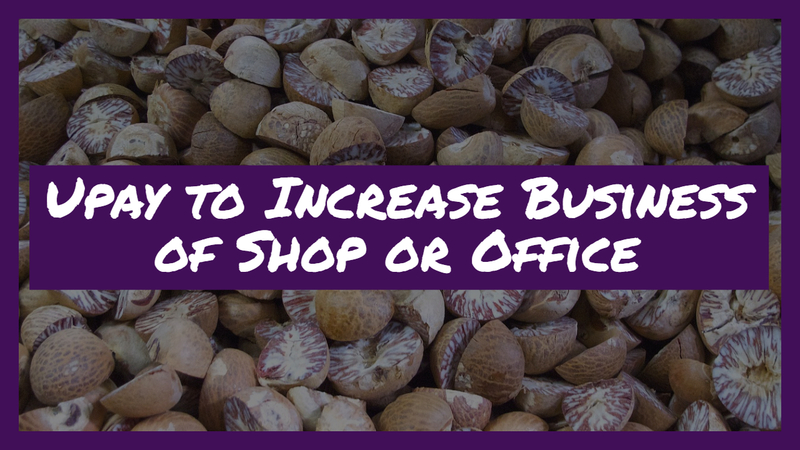 In this post, I have written about a Upay to increase the sales and business of a shop or trading firm. This simple, easy and cost effective paranormal remedy is said to remove the problems that are preventing business growth and improve the turnover and profit of the business and make it vibrant and prosperous. This Upay can be easily practiced by any shopkeeper or trader who want to make his business healthy and prosperous by following the procedure given below. 1] This Upay has to be practiced for 5 Saturdays and it should be started on a Saturday. 2] The practitioner should take 5 Jaiphal or Nutmeg in the English language and place them in a red colored piece of cloth and tie the cloth to make a small Potli or bundle. This bundle should be tied with a thread on any of the 2 upper corners of the main entrance of the shop or office. 3] Then, on the next Saturday, the practitioner should remove the bundle and rotate it over his own body in a clock manner. This is called as an Utara, which is simple exorcism ritual. 4] Then, the practitioner should burn all the 5 Nutmeg to ash and collect the ash and keep it aside in a separate bundle. 5] Then, he should once again put 5 Nutmegs in the same piece of cloth and prepare a small bundle and hang it in the same place. 5] This, procedure should be repeated on all the 5 Saturdays, in the same manner described above. 6] Then, on the 5th and last Saturday, the practitioner should take all the collected ash and immerse it in a flowing water body, like a river, sea or canal. 7] Then, he should tie the red colored cloth on the trunk of a Peepal or Sacred Fig Tree and go back to his home and while going back, he should not glance back over his shoulder or speak to any person until he reaches his home. The practitioner should also light an Agarbatti or Dhoop, everyday in the morning after opening the shop or office. Notes- This paranormal remedy should be started on a Saturday and the ritual of burning the Nutmegs should be performed for the next 5 Saturdays, so that makes it 6 Saturdays in all. The remedy will also remove evil-eye, black magic and any other harmful and regressive energies from the body of the practitioner and the premises of the shop or business place. Hello Mr Neel. I am BRIJESH from Fiji. For loNG time I'm following your upays . You have sent 1 upay to increase the business in shop. Do we have to be vegetarian while or after completing? Hi there, I live overseas and we don't have peepal or fig trees here.. what else can I do with the red cloth then?